Madrid’s most important recent project, finished in 2011, is the M30/Manzanares Linear Park, known by everybody as Madrid Río. The project organizes the 8 km of the banks of the River Manzanares, design ing 115 Ha of parks, a dozen of bridges and 6 Ha of public and sports facilities, interpretation and art centres, an urban beach, playgrounds and cafes, and the restoration of the hydraulic architectural heritage. The project connects Madrid with the valuable landscapes around the city. The authors of the project were Burgos & Garrido together with Porras La Casta, Rubio & Á-Sala, West 8 and the participation of Dominique Perrault. Clemson University students had the great privilege to visit 4km of this project with Jaime Álvarez from Burgos&Garrido who was in charge of the project and its construction. He showed them the monumental part of the project next to the Royal Palace and the Casa de Campo Park, the Salón de Pinos area, the Arganzuela PArk with Perrault’s bridge, the urban beach (which appeared after asking children from Madrid what was missing in their city) and the shell bridges by West8 and Daniel Canogar. More than 4 hours walking along the river which seemed to be only a few minutes. The importance of the project is reflected in its selection in the 2013 Mies van der Rohe Award. Our Texas A&M students shared with us some pictures from their group pretty “coldish” visit to Berlin past February 8th..
On Wednesday February 27th, during the Field Trips Seminar with Prof. Ivan Blasi, you will be visiting MBM architects, formed by Oriol Bohigas, Josep Martorell and David Mackay. 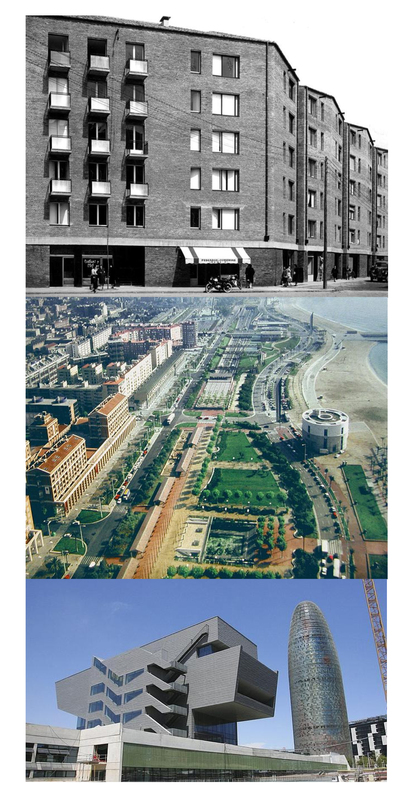 The latter will introduce us to the development of one of Barcelona’s most important and strategic projects, the Olympic Village neighborhood built in 1992, but also to their most recent and also controversial projects such as the DHUB building in Plaça de les Glòries. Since you’re working in the nearby Barceloneta neighborhood in Studio. The relationship with the 1992 project by MBM can determine some of your concepts. Questions on ways of facing projects, work organization or the future of cities will for sure come out during the 2 hours at MBM. A unique opportunity! Conference titled “Smart Urban Visions, New York City”. Peter Mullan will explain the unique experience of High Line urban park, while Projjal Dutta will describe the strategies and sustainability of infrastructure projects in the mobility of the American city. The event is organized by the Smart City World Congress, including the director of the conference, Pilar Conesa, who will be responsible for the presentation. The Dean of the COAC, Lluis Comerón, will conclude the event. Entrance is open to public and the conference will be in English. Wednesday February 20th, Professor Anna Ramos and her Design Communication students from Texas A&M made a site visit to a project by Ros-Sutrias architects–what will soon be the Residència Asistida i Centre de Dia a l’Hospitalet de Llobregat, an elderly care facility with a large commercial space on the ground floor.